Is it weird that I really like Omar Sy, but I don't care for his movies? Okay, I haven't seen him in Jurassic World yet, but I have seen The Intouchables and Mood Indigo and I was very underwhelmed by both. I know a lot of folks loved Intouchables, but I have to tell ya, that inspirational drama b.s. forces so many eyerolls from me. But Sy is so charismatic and charming to watch that you just want him to win at life. 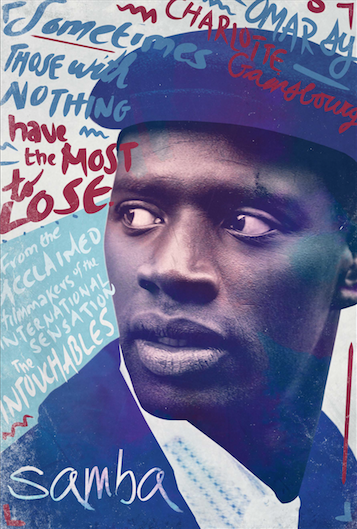 Samba reunites The Intouchables’ acclaimed directing duo, Olivier Nakache and Eric Toledano, with award-winning actor Omar Sy in a richly entertaining chronicle of an undocumented kitchen worker battling deportation from his adopted home in Paris. When Samba (Sy) is suddenly ordered to leave France, he enlists the help of Alice (Charlotte Gainsbourg), an emotionally vulnerable immigration advocate with little experience but plenty of heart. As the immigrant aspiring chef and the burned-out corporate executive tentatively explore an unexpected bond, they inspire each other to reinvent themselves in this vibrant comedy full of tender humor and heartfelt optimism. SAMBA hits theaters New York and Los Angeles on July 24th.